The 1Cam 3D utilizes two Full HD sensors to capture true 3D 1080 video which is transmitted over Coax or Fiber optics. In case of missing fiber infrastructure, SD, HD and 3D video is recorded to 512GB storage allowing for well over 48 hours of recording. We recognize that no two projects are the same. That is why we have various options such as Ethernet downloading and control, SD video long line driver, 100% Titanium 6000m housing, auxiliary I/O pins for custom events and triggers and more. SubC excels at building reliable custom equipment. Designed as a main 3D HD color 10x zoom camera where live video is transmitted over coax as 3G-SDI. Live SD video is also available. The 1Cam 3D can take 6-20 Megapixel digital stills and has internal recording of 3D HD to 512GB of storage. It comes with external strobe and laser output, programmable intervals, many more features to help minimize time at sea. The 1Cam 3D features a Real Dual Sensor Synchronization which results in true 3D footage with sharp edges and well defined shapes, high fidelity for moving objects and outstanding depth perception. Other competing products have what we call “quasi” 3D where their sensors are not synchronized at the camera. This results in blurred edges, poor quality and even motion sickness. 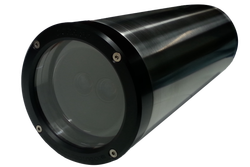 The 1Cam 3D is built with standard depth rating of 3000m with a Stainless Steel housing and flat sapphire window.